For nearly 30 years, Tidd Tech Ltd. has been the industry leader in lightweight snow grooming equipment. Want great cross country ski trails without the huge investment of having a snowcat? Tidd Tech groomers can help you create World Cup quality XC ski trails using a snowmobile or other small utility tow vehicle. 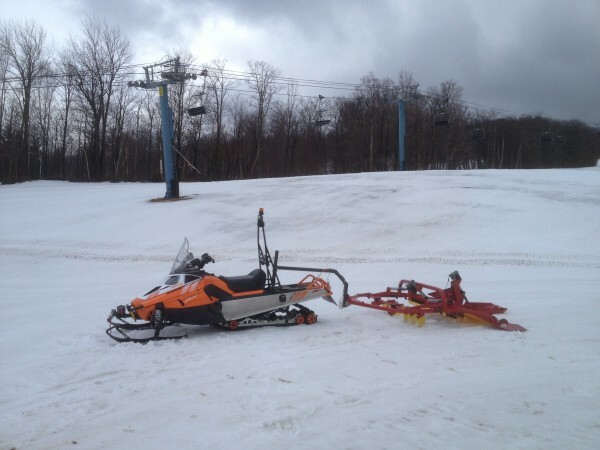 Tidd Tech machines are the most versatile, cost effective snow grooming implements available. Their use isn’t limited to just classic or skate skiing. You’ll find our equipment being used at alpine ski areas, grooming sledding hills, keeping dog sled trails in paw perfect shape, packing out snow shoe trails and even creating compacted access paths on non-plowed roads. If you have snow to groom, regardless of your snow conditions, Tidd Tech products are up to the task. Low snow or deep, dry powder, white cement or ice, Tidd Tech groomers have been proven in a broad range of applications as having the best snow working capability in their class. Like its predecessor, the Trail Tenderizer the G2 sets the standard for ski trail grooming with a snowmobile. It is the most innovative renovator/compactor/tracksetter combo on the market. The well thought out design of the G2 allows it to be utilized in a broader range of snow conditions than any other implement we know of. Its five stage snow working system creates better snow molecule adhesion leading to a firmer, more stable and smooth skiing surface. Unlike other implements on the market, the G2 doesn’t plow snow but rather keeps it where you want it, on your trail! The hardened steel teeth really make the G2 stand out in hard pack and icy conditions. The unit is equipped with electric actuators for raising and lowering both the toothbar and tracksetter on the fly. For the fussiest groomers out there, the G2 serves as an incredible base platform to which we continue to add accessory items to meet the specific needs of the most challenging grooming scenarios. The G2 comes in three sizes: 4′, 6′ and 7′. The 4′ unit renovates approximately 44″ and combs 72″, the 6′ unit renovates approximately 68″ and combs 96″ and the 7′ unit unit renovates approximately 80″ and combs 108”. The Tidd Tech Snow Roller is an extremely tough implement designed to compliment our Trail Tenderizer or other finish grooming tools. Whether you are interested in packing early season snow, handling the “big dumps” or just trying to conserve every inch of your precious snow base, this is the roller for you. Constructed from very stiff and durable HDPE double wall culvert material, the drum will roll over rocks and stumps without damage and shed sticky snow. The drawbar is built just like our proven Trail Tenderizers, with a shear pin hitch to protect both the equipment and operator. And to top it all off, we have added an innovative basket system that will hold two 30 gallon plastic trash cans on the drawbar – great for hauling snow to the bare spots, shovels, trail or race signs, and even skis and poles. What will a roller do for you? We believe that a roller is a useful tool when used in conjunction with a grading and leveling implement like the Trail Tenderizer. 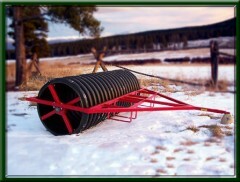 There are three primary reasons to supplement your grooming with a roller: A roller can be used during the early season to pack the snow base before it is possible to use a finish tool like the Trail Tenderizer.A roller can be used to pre-pack deep snowfalls – a condition that would normally require multiple passes “pre-packing” with just the snowmobile before finish grooming.A roller will pack all the available snow into the snow base without displacing any to the side of the trail. A deep ribbed roller like ours will leave a pattern that catches blowing and drifting snow during and after a storm. It is possible to actually gain base beyond what has fallen from the sky by continually rolling during periods of blowing and drifting snow. What can’t a roller do? A roller cannot level and grade like the Trail Tenderizer or other finish tools. One of the advantages of a roller is that it does not displace snow (see #3 above). High and low points will remain after rolling and should eventually be graded with an implement like the Trail Tenderizer.